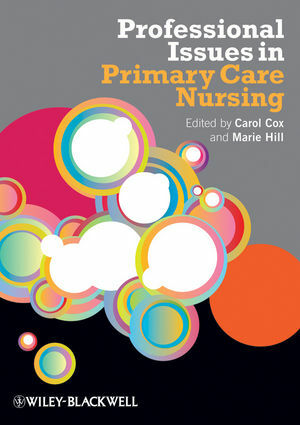 This book enables nurses to get to grips with the professional issues that affect their practice in primary care. It is structured around the RCN domains of practice and considers a wide variety of issues including health promotion, reflective practice and leadership. Part One sets the scene for the domains of practice which follow and considers the unique aspects of practice and walk-in centre nursing. Part Two considers practical aspects of each of the RCN domains of practice in turn and is centred around nurse–patient relationships. Carol Cox is Professor of Advanced Clinical Practice Nursing and Research Lead for the Department of Applied Biological Sciences in the School of Community and Health Sciences, City University London and Nursing Research Lead, Moorfields Eye Hospital NHS Foundation Trust. Marie C. Hill is Senior Lecturer in Practice Nursing, Public Health, Primary Care & Food Policy Department, School of Community and Health Sciences, City University and Lead for Practice Nurse Development in City University. 1 The historical development of practice nursing and walk-in-centre nursing (Marie Hill, Carol L. Cox and Shuling Breckenridge). 2 Practice nursing: the unique nature of practice nursing (Marie Hill). Education and training: are today’s PNs equipped for their role in primary care? 3 Walk-in-centre nursing: the unique nature of walk-in-centre practice (Jane Bickerton). What is the clinical role of the nurse in the WiC setting? 4 The context of practice nursing and walk-in-centre nursing: domains of practice and competencies –setting the scene (Carol Cox). 5 Critical thinking and diagnostic reasoning in clinical decision-making (Nita Muir). 6 Health education and health promotion (Daryl Evans). 7 Working with individual patients and groups: creating and strengthening relationships (Karen Thompson). 8 Confidentiality, privacy and dignity: ethical, legal and cultural issues (Nicci Whiteing). 9 Anticipatory guidance: National Service Frameworks (Vicky Lack). How does anticipatory guidance relate to the NSFs? 10 The creation of an environment for effective learning (Marie Hill). 11 Clinical supervision: reflective practice; learning through experience (Chris Johns). 12 Use of theory and research to inform practice (Jane Bickerton). 13 Collaboration and working with the multidisciplinary team and agencies (Kathryn Waddington). 14 Leadership and organisational decision-making: the nurse’s role in implementing policy and practice (Kathryn Waddington). 15 Implications of the new GMS contract (Marie Hill). The new GMS contract: is it working? 16 Art and science of providing quality nursing care in general practice and WiC settings (Carol Cox). 17 Meeting the cultural and spiritual needs of patients in general practice and WiCs (Anjoti Harrington). 18 Cultural diversity within the general practice and walk-in-centre settings (Maisie Allen). How does multiculturalism and diversity impact on health? What can nurses in primary care do to improve health care in a multicultural society?